Industry Standard for the best playing cards world wide. Poker Size. Red. 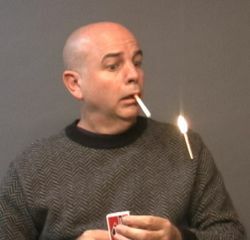 Bring a box of matches from your pocket and explain, "This is a very strange box of matches. Notice the rubber band around the box. It's there to keep the matches from escaping. 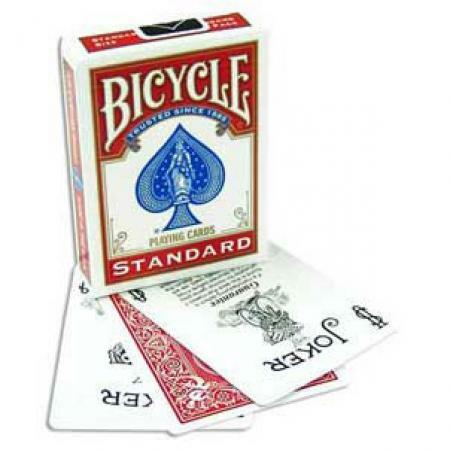 Watch what happens when I remove the band..."
Bring out a deck of Bicycle cards and remove it from its box. Spread the cards on the table as you ask, "Did anyone notice that I removed these cards from a tiny box?" To everyone's surprise you are now holding a miniature Bicycle card box; the poker-sized box is completely gone! A cigarette slowly floats out of its pack and up to your mouth. Suddenly the pack changes into a box of matches. The drawer slides open by itself and a match floats out, strikes itself, then floats up and lights the cigarette! John Kennedy will teach you how to perform this amazing illusion. Just pop the CD into your PC or MAC computer and enjoy the video, photos, and clear instructions! Also included is an extra "Float Gimmick." This is the new improved gimmick, so you can essentially update a previous version of the Animated Cigarette.